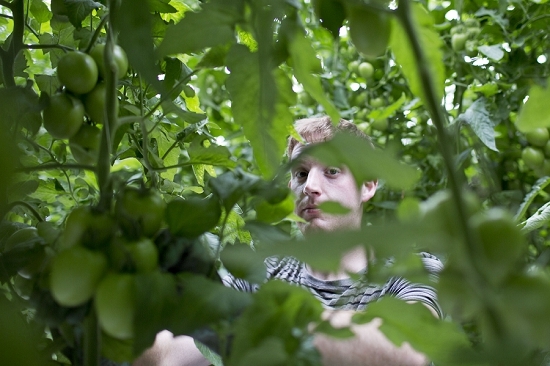 "It was a million to one chance that I would become a commercial tomato grower," says Gary Griffiths, guiding me around his plant-stuffed glasshouses. Son of a greengrocer, Gary grew up in Tooting, went to school with snooker player Jimmy White and has childhood memories of buying trips to the old Covent Garden and Borough markets. 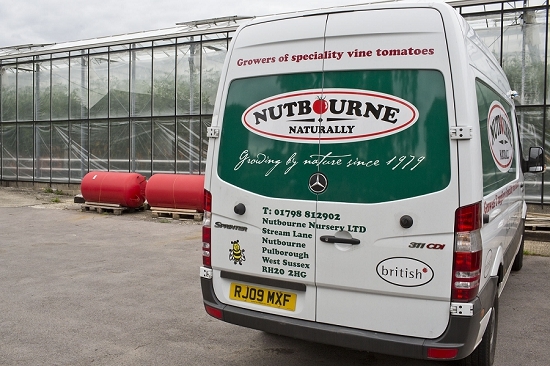 Now he runs Nutbourne Nursery in a tranquil area of Sussex and is possibly Britain's top grower of specialty tomatoes. 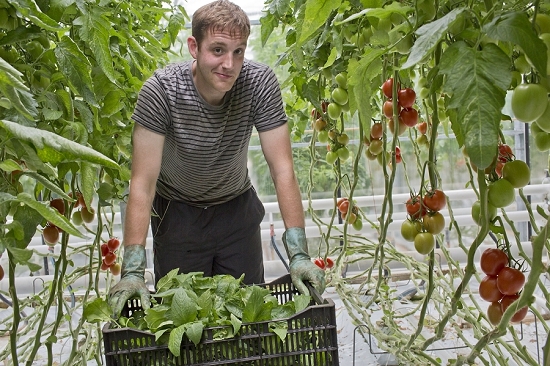 "No-one else is doing the vine tomatoes in mixed boxes – it's a niche product," he says. 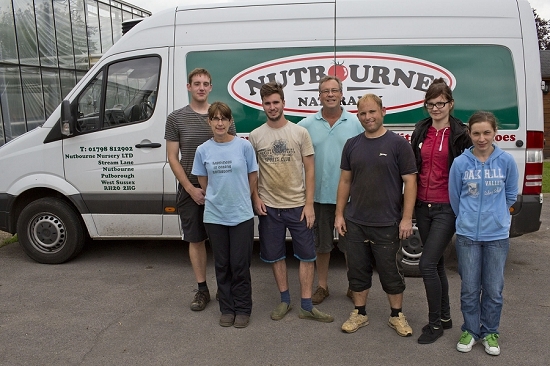 Nutbourne is a family business (his wife Jenny is the model above), with 0.41 hectares of glass and a small, highly skilled team. 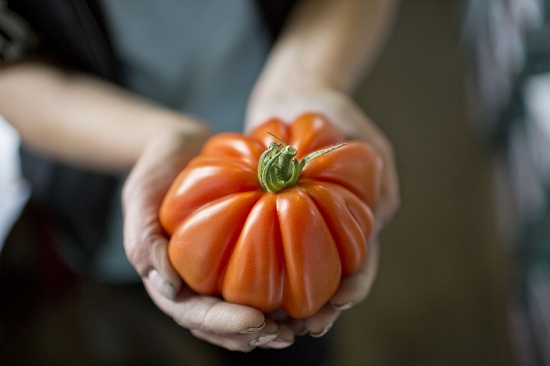 They grow dozens of varieties, from the bite-sized 'Couer de Pigeon' ('Pigeon Heart') to larger 'Couer de Boeuf' ('Ox Heart'). 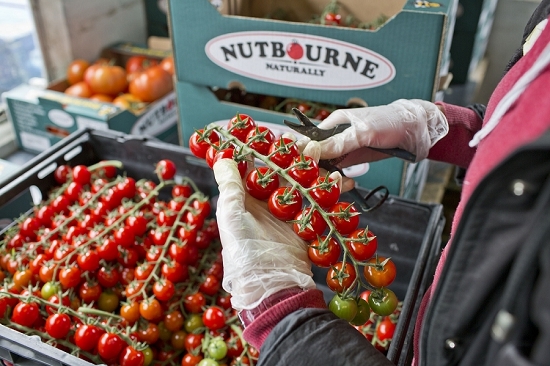 Indeed, the Nutbourne range of tomatoes was featured in our Tomato Product Profile back in May. 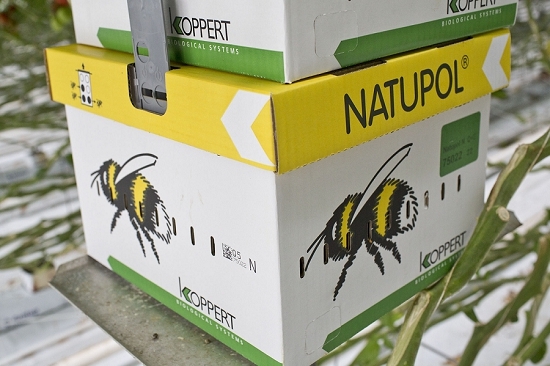 Gary says: "We want to produce nice colour in the boxes – stripy fruit like Tiger, striped orange, pink, yellow and dark brown." 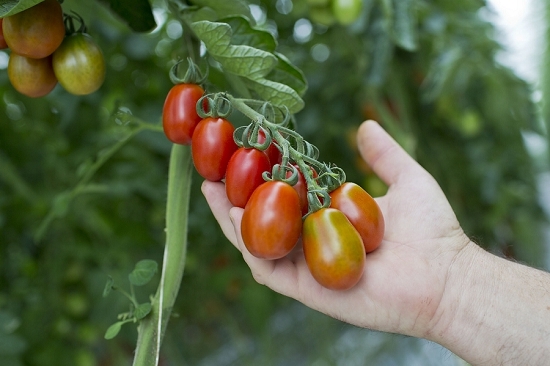 He trials new varieties each year and is rigorous in selecting only tomatoes that deliver in terms of flavour and yield. 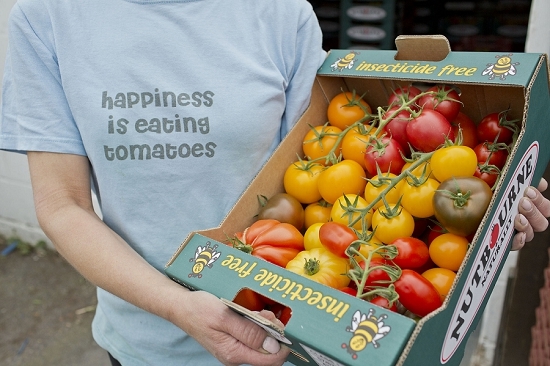 One of their newer lines, for example, is a Pineapple Marmande - yellow with an attractive tinge of pink. Gary explains that the original concept for their mixed boxes came out of desperation some years ago. 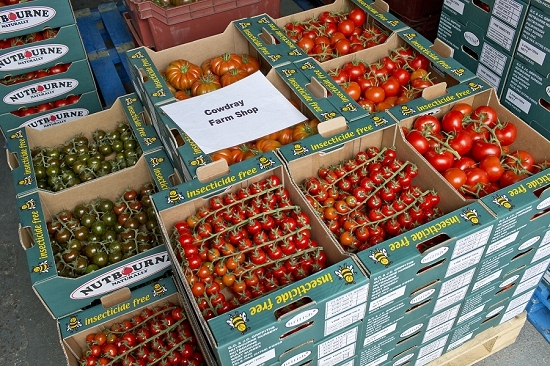 "We took a big gamble by growing all these varieties. We put our heart and souls into it," he says. "Every variety has a different cultural requirement… It would be much easier selling one [variety] to a supermarket." 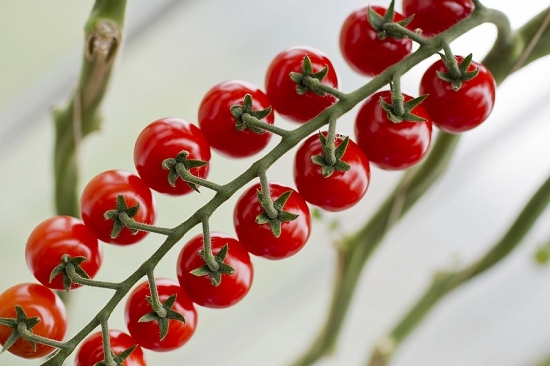 Their state-of-the art operation is a hydroponic system in two glasshouses, in production from March to November. The vines can reach 30ft long by the end of their season and grow up to 2ft per week. Pollination is by imported bees. His team pick three times a week, with deliveries to a range of distributors across England plus a circuit of local shops. 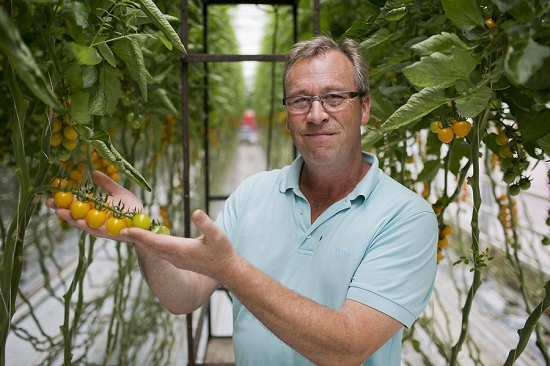 Over the last decades, Gary has seen many similar-sized growers nearby shut down or switch product in the face of stiff competition from abroad and escalating energy, water and labour costs. "I have seen them all go by the wayside over the years. It's only been my sheer stubbornness that’s stopped me from going that way." Available for sale at the Market from wholesalers Bruce White and Premier Fruits and from wholesale distributors Allison Risebro, Cream of the Crop and First Choice.